Ronald E. Groves, artist and writer, has served as president and creative director of his advertising agency for more than fifty years. He now works in a one-man office as a marketing and advertising consultant and computer graphics designer. He also creates wildlife paintings, and dabbles in photography and sculpting. This is a creative non-fiction story based on real characters in real-life situations covering approximately twenty-five years of the author’s life. The story includes more than seven years spent in the Delaware County Children’s Home during the mid-thirties and early forties, living in two foster homes and how this life affected future decisions, his career and personal ccomplishments. The story also follows the lives of his five siblings when the six brothers were orphaned at an early age during the depression. 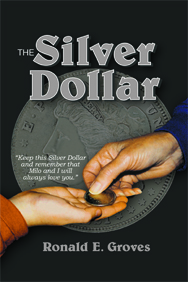 Throughout the story, reference is made to a silver dollar given him by the Hartzells, his first foster parents, when the Welfare Department took him away from them. Were they abusive? Was something wrong with him? Was he uncontrollable and they couldn’t handle him any more? Twenty-two years later, he found the Hartzells in Rochester, NY hoping to find the reason why he was sent back to the Children’s Home; a question that had been bugging him since he was eight years old.